The food industry has revolutionized so rapidly that the moment you order your food, the next minute delivery boy is at your doorstep. Get your favorite food served hot right at your home. 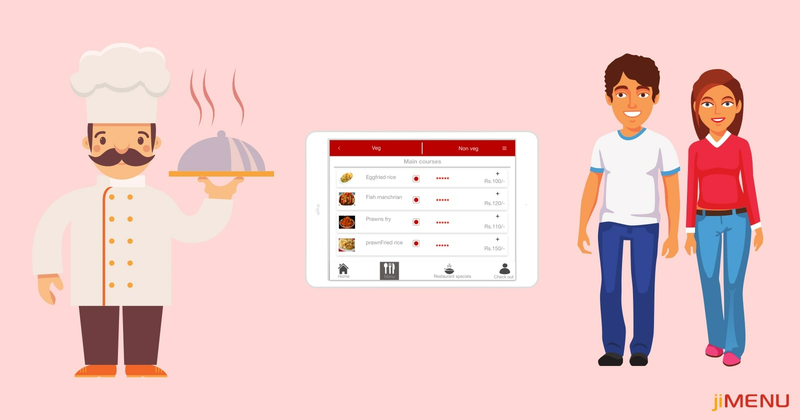 And the reach of technology just doesn’t end here, when we go for offline food, it has impacted equally by offering a wide range of advanced tools and techniques to make restaurant management easy, fast, interesting, and reliable. Agree? Beginning right from the boards displayed outside the restaurant till the payment, technology has proved its wide expansion. One such attractive transformation in the food industry are the digital menus which have proved the large customer base by attracting the customers towards the enhanced food menu items. And not only the restaurant owners are going to benefit from the digital menus, rather it has equal benefits on the customer end too. Saving customers time and offering him with an easy, quick, and reliable services along with increasing the sales and customer base for the owners is just a win-win situation. Isn’t it? To get into more depth about how a digital menu will benefit both, the restaurant owner and customer, go through the following highlights and get a clear view of digital menus implementation. Budget-friendly & Hassle-free: What is the first thing that comes into your mind while getting a new menu for your restaurant? Planning the structure of the menu, then getting it printed, and then delivered. The whole process will definitely acquire your huge time, capital, resources, and labor too. And once you have got it designed, in future you need to make amendments about the new dishes or the ones which got deducted. What now? The whole process of planning, designing, and printing repeats. Right? Simply going for a digital menu would eliminate all this hassle and cut your costs by replacing the paper menu and offering you an online platform where you can make the changes anytime, anywhere without anyone’s involvement. Optimized Sales: Once you have invested in digital menu, you are set free from all the formalities and other tasks involved while preparing a menu. Once you have got your digital menu designed which displays a wide range of your food items, deals, offers, special dishes in the most attractive manner, it will directly attract more customers towards your services. Thereby, increasing your customer engagement with an increase in the sales of your eatery. Time-saving solution: Instead of looking up in the long and never-ending list of paper menu, customers get to see a brief display of the meal they are looking for. This helps them in searching the desired food precisely and the attractive pictures added in the menu satisfies them that they are at the right place and will be served the best! Enhanced experience: Getting the quality food range with their added bright high-resolution pictures makes the customers feel good about the food they are ordering. Alongside, they get a brief view of the deals, offers, and discounts side by side which attracts them to stay with the restaurant longer. This is just not all a digital menu can offer you. For more details and better experience, you can reach us. Our team would be glad to serve you.